Global wireless POS terminal market is expected to rise with a CAGR of 12% during forecast period 2017-2024. The key factors driving the market growth are rise in cashless transaction across countries, rise in e-commerce transaction, increased adoption of wireless pos terminals by retailers, and increasing adoption of wireless technology in mobile handsets and wearable and mobile handsets. Whereas, market faces some restraints such as security concerns related to wireless technology and high cost of maintenance of wireless POS systems. Market has some opportunities such as reduced cost and increased reliability of wireless technology and increased adoption of dual-interface chip technology and increased application support by HCE (Host Card Emulation) and NFC (Near-Field Communication) that can help to boost the market growth. In contrast, some challenges faced by the market are low rate adoption of wireless POS terminals, low consumer awareness regarding wireless POS technology and lack of standardization. North America is the leading market for global wireless POS terminal market in terms of market revenue share. This is due to rising modernization in retail sector due to emergence of cashless payment along with increased focus on business specific and customized payment solutions. Moreover, increased adoption of wireless POS terminals across various end-user industries such as entertainment, retail, hospitality etc. 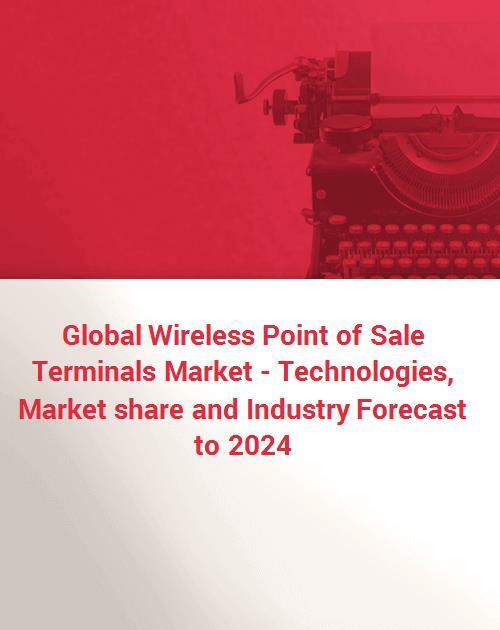 Furthermore, high compliance requirements such as Europay, MasterCard, and Visa (EMV) in North America has propelled the growth of wireless POS terminal market in North America. However, Asia Pacific is the fastest growing market region during forecast period 2017-2024. This is due to advantages of wireless POS systems such as decrease in check-out space requirement, high-degree of security, low queue time, paper-free receipt option etc. Global wireless POS terminal market is influenced by presence of leading companies such as BBPOS International Limited, Diebold Nixdorf, First Data, Newland Payment Technology, WinPOS etc. Product launch, joint venture, merger and acquisition are some of the crucial strategies adopted by key market players to gain competitive advantage. The report on global wireless POS terminal market includes component, type and industry. On the basis of components used in wireless POS terminals, market is segmented into hardware and POS software and services. POS hardware is the dominating component segment owing to the increased adoption of POS hardware such as monitor, receipt printer, card reader, etc. in retail sector. On the basis of types of wireless POS terminals, market is bifurcated into mPOS (mobile Point of Sale), Portable Countertop & PIN Pad, Smart POS, etc. Portable Countertop & PIN Pad is the leading type segment due to its advantages such as compact size, easy installation etc. which has led to increased adoption of Portable Countertop & PIN Pad in small business enterprises with in-store purchases. However, mPOS is the fastest growing type segment owing to the low installation cost and ease of accessibility of mPOS devices. Various industries in which wireless POS terminals are used are healthcare, hospitality, retail, sports & entertainment, transportation, etc. Retail is the leading industry segment as wireless POS terminals are used to prevent transaction frauds and facilitate secured online payments in the retail sectors. Sports and entertainment industry is the fastest growing segment as wireless POS devices are extensively used in sports stadiums, theme parks, movie theatres etc. for flexible payment services and enhanced growth in sales.